Throughout multiple iterations of its mission profile, EM-2 was intended as the first crewed flight of NASA’s Orion spacecraft. 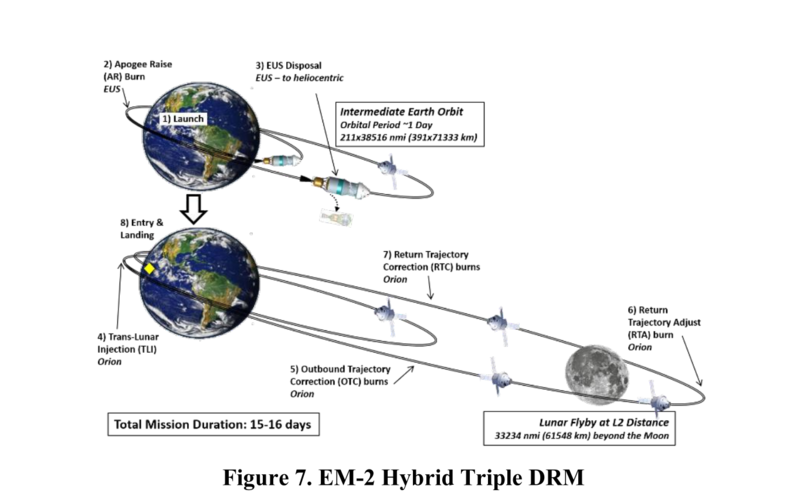 Whereas the major design, development, test, and evaluation (DDT&E) periods for EGS and SLS run through EM-1, Orion’s development was divided into three phases which run through EM-2. The third and final phase following EM-1 adds the complement of crew systems, life support systems, and fully active launch abort elements to the Orion system on EM-2. One of the first concepts for EM-2 was to put Orion and a four-person crew into a high lunar orbit for a few days. A subsequent iteration reduced the crew size to two for a month-long flight to rendezvous with a “redirected” asteroid on the crewed flight of the overall Asteroid Redirect Mission (ARM). The latest mission profile more directly attempts to reduce some of the risks of a first crewed flight. Called a “hybrid triple” in early presentations, the profile has Orion flying in three orbits: a low Earth orbit still attached to the booster upper stage, a high Earth orbit (HEO) by itself that lasts for about one day, and a single solo lap around the Moon before returning to splashdown on Earth. The profile was retained when the mission moved from ICPS to EUS, where it was dubbed “Multi Trans-Lunar Injection” (MTLI) after addition of the PPE secondary payload. Using ICPS for the hybrid triple was again studied last year when the feasibility of flying crew on EM-1 was done; although the profile was still feasible, it was decided to keep EM-1 as-is and not put crew onboard. Now back again to ICPS, the EM-2 mission doesn’t really change much from the point of view of Orion and her crew. “[It’s] pretty much the same thing,” Nujoud Merancy, Exploration Mission Analysis Lead at NASA’s Johnson Space Center, said in an interview with NASASpaceflight.com. SLS Block 1 Crew vehicle carrying Orion nears SRB burnout. Credit: Nathan Koga for NSF/L2. After two orbits, the ICPS will fire to place the two in an even more elliptical High Earth Orbit (HEO), and then Orion will separate from the upper stage. Merancy said the proposed orbit would be 38,600 by 127 nautical miles, with a period of about 24 hours. The purpose of the long orbit is observe the performance of new spacecraft systems close to home, especially the crew systems on their first flight. 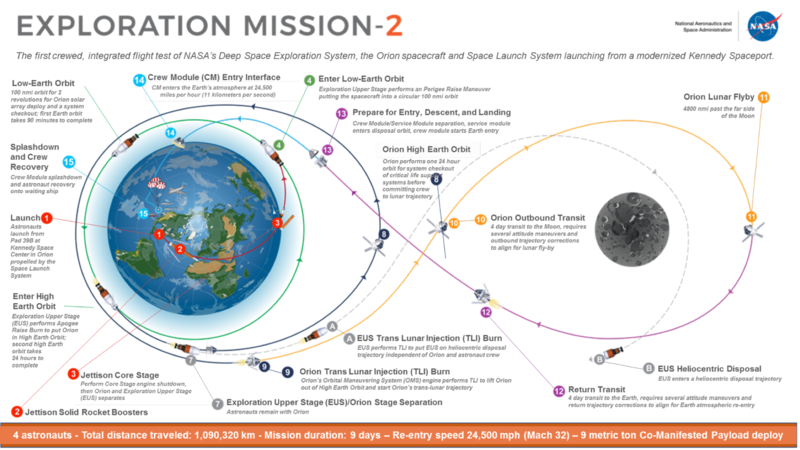 On a more typical lunar/cislunar mission, Orion and crew would be on their way to the Moon a few hours after launch. ECLSS stands for Environmental Control and Life Support System. The amine swingbeds are a part of Orion’s carbon dioxide removal system, which itself is a part of the ECLSS. “By having the 24-hour orbit, now the crew has to exercise, they go to sleep, they’ll use the potty — the WMS (Waste Management System),” Merancy explained. “To the crew, it’ll look like a nominal day essentially,” she added. Assuming Orion and crew are healthy, the spacecraft will then use its main engine to perform a TLI burn that will set up a “free-return” lunar flyby at an altitude of about 4800 nautical miles above the far side of the Moon before returning to splashdown on Earth. The flyby distance was picked for its timing. When work in the SLS Program on the ICPS was formally suspended in 2016, the ICPS still needed to be outfitted with additional systems and hardware to meet NASA’s human rating standards. Now that it will fly crewed missions, one of the primary additions needed is emergency/fault detection avionics. Although it was decided not to fly crew on EM-1, it was realized in the technical feasibility assessment that United Launch Alliance (ULA) was certifying an emergency detection system (EDS) that will fly on the Atlas V booster being used by Boeing’s CST-100 Starliner Commercial Crew vehicle. “It would be much easier to put crew on ICPS now then it was before when we thought we were going to have to make a whole new avionics system for it in order to human-rate it,” she added. One of the long-term efforts that ULA has been working on is integrating “Common Avionics” across its Atlas and Delta launch services, standardizing computers and software that fly the vehicles from liftoff to spacecraft separation to end-of-mission. Common Avionics debuted on the Delta 4 with the launch of the National Reconnaissance Office-47 (NROL-47) payload in January after first flying on Atlas V launches. ICPS is also using ULA Common Avionics. 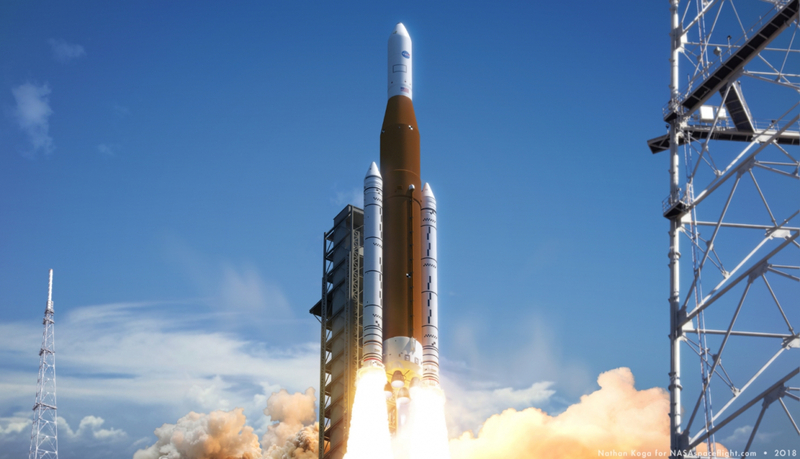 “ULA’s Common Avionics suite does afford the ICPS with EDS interface compatibility,” Janet Anderson, Public Affairs Officer at NASA’s Marshall Spaceflight Center, said in an email. During the ASAP’s May 17 meeting, Dr. McErlean noted that the crew on EM-1 study conducted last year also had additional benefits. “We learned that the ICPS was in fact more tolerant to MMOD (Micro-Meteoroid and Orbital Debris) damage, which was its primary weakness in terms of human-rating, than was anticipated,” he said. Now that the scheduling iron-bar has been removed, a new launch readiness date still remains to be re-evaluated for EM-2. 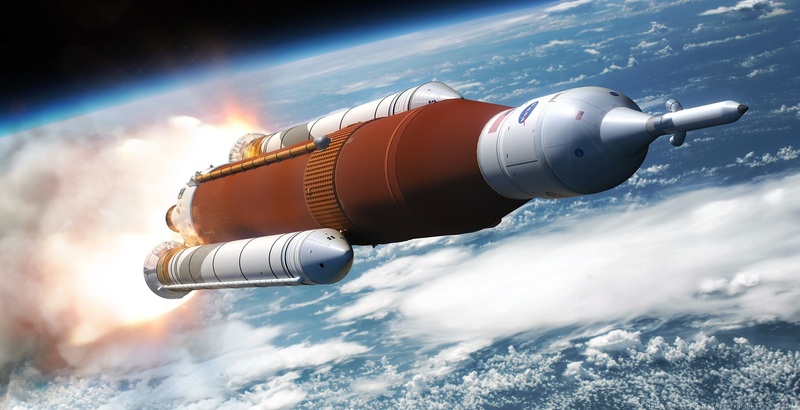 At a recent media event in Houston, NASA Orion Program Manager Mark Kirasich said the Delta CDR for the Orion EM-2 vehicle is scheduled for the early Fall, perhaps in the October time-frame.